I few months ago, when I was still laid up and hadn't been cleared to run, I spent a lot of time thinking about how I wanted my fitness journey to look once I came back. I knew I wanted to focus more on my own fitness goals and also have the freedom to do whatever workout or run struck my fancy whenever the whim hit. I wanted the freedom to make my own schedule again. But, I'm a coward and was scared to give voice to this because a major part of having more independence in fitness meant letting Elizabeth down. She has been such an amazing support through this entire process, and she's my bff. I felt terrible telling her that I wanted to be able to focus on what I want and what my body wants. I felt bad telling her that I didn't want to run every run with her. Apparently I am incredibly transparent and she reads me like a book. And I legit almost started crying because why is she so good to me?! Later that month, we went to the gym and I told her that I had done a lot of thinking and wanted to be able to work out together two or three times a week, but that I also needed to have days when I could workout alone. She was really receptive to this (of course!) and we kind of discussed what that might look like. That's why my runs lately have been a nice mixture of alone/with Matt/with Elizabeth. It's been perfect. Solo runs give me a chance to focus on my body and how things are going, get some alone-time, listen to music, and do whatever I want. They are incredibly important to me, and I appreciate them more than ever now. 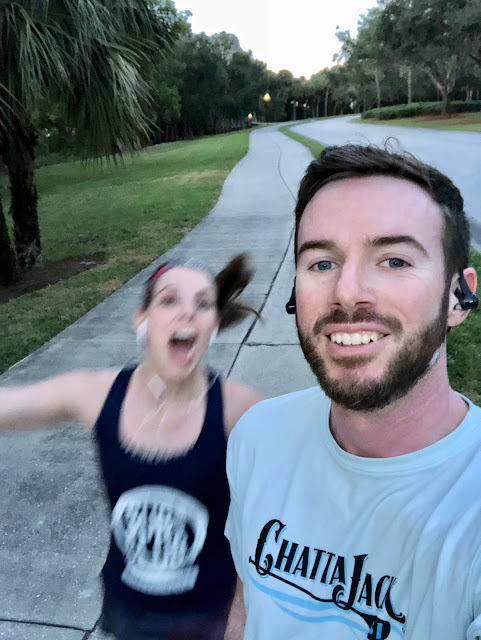 Running with Matt offers a lot of the same, because we rarely talk during runs or even run side-by-side, but it also gives me a nice support system when I'm feeling uncertain or self-conscious. Plus, we're both so busy lately that running together gives us some good couple-time. Matt's photography skills (and his willingness to be my own personal paparazzi) are an added bonus to running with him. 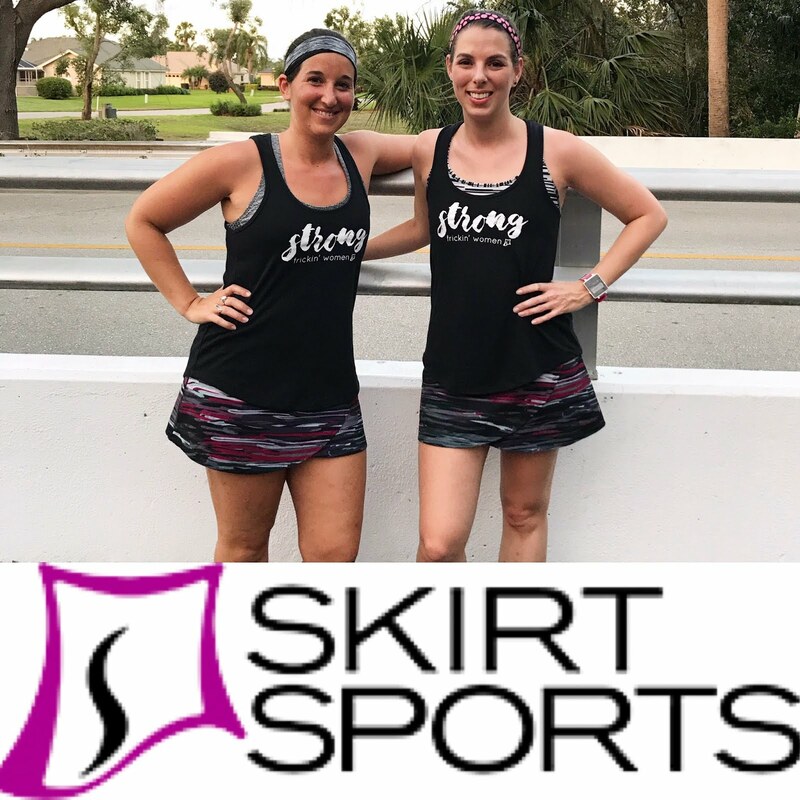 Running with Elizabeth gives us both some much-needed socialization during the week as well as motivation and accountability. I don't ever want to give that up completely; I just needed to cut back. I hope to be back to running 3-4 times a week by mid-April. 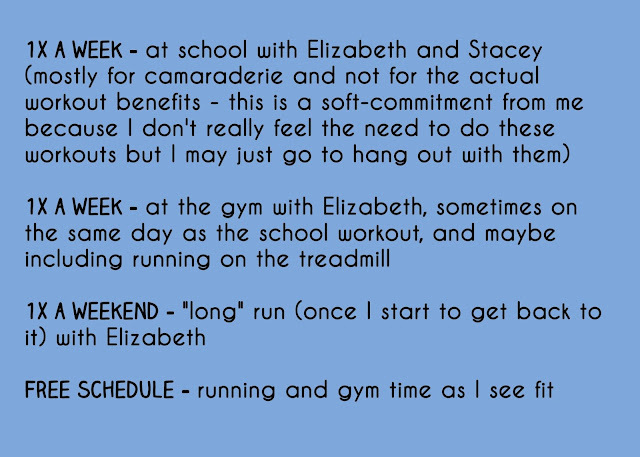 I know this schedule will remain flexible - none of these plans are set in stone - and I told Elizabeth I'd help her get out the door to run on her own on days I don't go with her to help her stay motivated. 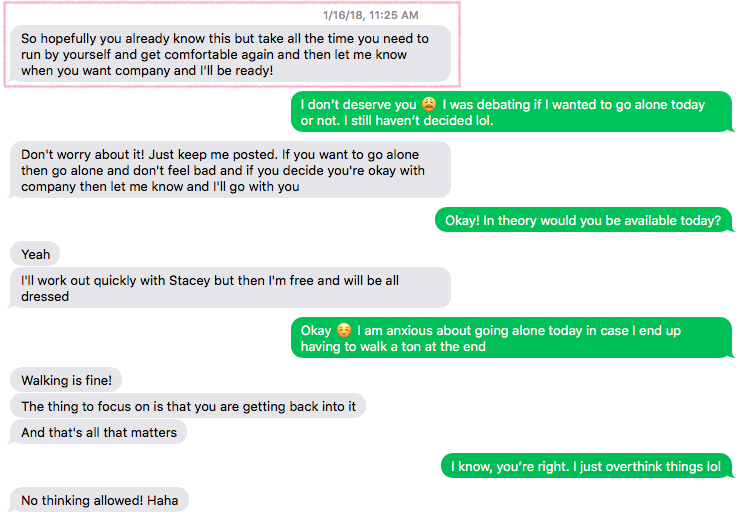 This whole thing had been a big source of stress for me because I overthink everything and didn't want to hurt anyone's feelings, but now that I know I'll have plenty of alone time mixed in with buddy-time, I feel so much better. Already I've seen that my workouts have really benefited from having the freedom to do my own thing, and now I feel much more comfortable telling Elizabeth or Matt that I want to run alone. I am looking forward to every workout these days; everything feels new and exciting again. I hope this excitement lasts, and when it inevitably begins to fade, I hope the memory of a year of nothing and how awful that felt helps give me a kick in the pants!